Murad manufactures advanced and intelligible skin care that effectively brings up a variety of skin problems such as acne, aging, hyperpigmentation and cellulite. For over 20 years, Murad has led the skin care industry in the development of innovative, results-oriented formulations aimed at restoring skin health and general wellbeing. Murad was founded by Dr. Murad, who has treated over 50 000 patients over the last 30 years. Through his research, he made several discoveries that led him to develop his own skin care products, which can all use at home. The first products launched 1987. Dr. Murad was one of the first to launch skin care products with AHA and stabilized vitamin C to treat damaged skin and pigment changes. He was also one of the first to develop a complete skin care range specifically to treat the effects of hormone changes on the skin. Genetic aging, or the natural process of aging that occurs over time, results in a seemingly inevitable decrease in the production of firming collagen and Hudutjämnande elastin. Since the body begins to produce less of these two proteins, wrinkles can form and the skin loses its overall luster. Murad Age Reform Anti-aging products combine retinol-therapy to increase collagen production with AHA and BHA treatments to increase cell turnover and accelerate the movement of younger, clearer, firmer skin to the surface. Murad Age Reform products can give you firmer, more youthful skin with increased collagen production. Murad's products for acne work at the source of the acne deep beneath the surface iställe to just dry out the skin. 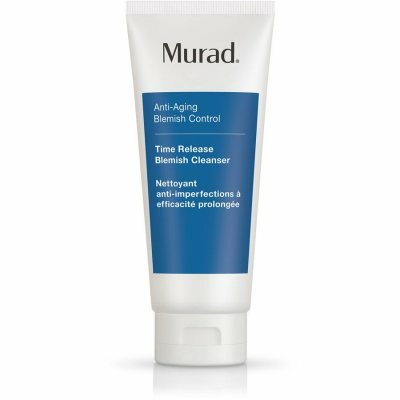 The ingredients in Murad's products for acne resnare existing eruptions while preventing new acne. This series has products both for acne on the face and on the body. The skin on the back is thicker than the face and the Talgkörtklarna is larger. Although the goal of Aknebehandlingen is the same for the face and body (to treat the source of the outbreaks and not the resulting spots), one must use other products to provide the active ingredients to the thicker skin on the back. Murad's products for acne on the body are created to exfoliate the powerful skin to allow salicylic acid to go into the skin and clear out the acne effectively. The products are: Clarifying cleanser, Clarifying body Spray and Blemish body Wash.
is a series specially designed to reduce large pores, reduce the amount of blackheads and control the oil on the skin. : Murad AHA-BHA Exfoliating Cleanser is a rich lathering formula that combines special Alpha and betahydroxisyror with natural jojoba beads to gently cleanse and exfoliate superficial skin cells. I..
Murad Essential-C Day Moisture SPF 30 provides powerful protection against environmental damage. Murad Essential-C Day Moisture SPF 30 also provides optimal hydration for environmentally stressed skin..
: Murad Perfecting Night Cream rejuvenates your skin while you resting up your skin while you sleep. This intensely hydrating cream nourishes and rejuvenates your skin overnight by replacing lost m..
: Murad Hydro-Dynamic Ultimate Moisture is for all skin types. The product moisturizes the skin and creates a youthful and silky smoothness. Murad Hydro-Dynamic Ultimate moisture keeps skin's moist..
: Murad Blemish & Wrinkle Reducer is a clinically proven Dubbelfunktionel formula. It contains "Komboucha collagen Defense" which reduces acne, stimulates the production of collagen and inhibit..
: Murad Perfecting Day Cream SPF 30 is ideal for all skin types. The product is designed to moisturize the skin and make it plump and supple. Perfecting Day Cream SPF 30 keeps the skin completely h..
: Time Release Blemish Cleanser is the first step in Murad's 3-Stegskur against acne and signs of aging. It is an extra gentle, low-foaming cleanser that treats the skin's acne problems while optim..
: Murad Clarifying Toner helps to remove excess grease and impurities from the skin, reduce pimples and promote a fresh finish. Murad Clarifying Toner absorbs excess oil from the skin and drenches ..
: is a moisturizing cream that fights acne and premature aging while giving the skin a smooth and undomlig complexion through advanced UV protection and healthy collagen support. Minimizes blemishe..
: Murad Resurgence Renewing Eye Cream works for all skin types. It is a formula to make the skin area around the eyes brighter by reducing pigmentation and dark circles under the eyes. It gives the..
: Clarifying Cleanser is a powerful and at the same time light and gentle anti-acne cleanser that thoroughly cleans the skin and pores. The thick foam cleans away dirt, make-up and excess oil ..
Murad Essential C Eye Cream is formulated with a blend of firming and brightening ingredients for a smooth, youthful eye contour. Murad Essential C Eye Cream helps to diminish puffiness and light diff..
: Murad hydrating Toner helps to preserve the skin's moisture and make it soft. This classic toner rebalances and moisturizes the skin while neutralising impurities. Hydrating Toner is an alcoho..
: Murad Oil-Control Mattifier SPF 15 PA + + is a 3 in 1 problem solver. Murad Oil-Control Mattifier SPF 15 PA + + is an oil-free moisturizer that gives an instant matte finish and controls sebum pr..
Murad Essential-C Cleanser is designed to prepare the skin for extreme rejuvenation, boost and maintain hydration. Murad Essential-C Cleanser encourages health and revives youthful brightness. Excess ..
: No skin care routine is complete without a deep cleansing mask. Enjoy a luxurious treatment and pamper yourself in your own home, while reducing the amount of acne by soothing and healing your sk..
Murad Age Reform Complete Reform with Glyco Firming Complex is a patented, multi-benefit treatment that transforms skin by increasing firmness 61% after just one application while also improving skin ..
Murad Essential-C Night Moisture is formulated with grape seed extract and vitamins C and E to neutralize free radicals and protect against environmental damage. Murad Essential-C Night Moisture boost.. This non-drying formula soothes skin by washing away excess surface oil, makeup, and impurities with softening extracts of Cucumber, Hawaiian White Ginger, and Algae. Important Ingredients Ha..
Lightweight moisturizer helps control oil production while providing broad spectrum sun protection against UVA/UVB rays keeping skin hydrated to deliver powerful antioxidant protection. Murad Balancin..
Murad Age Reform Rapid Collagen Infusion is a fast acting anti-aging treatment that allows you to experience a new level of youthfulness with a collagen-building ingredient clinically proven to reduce..
Murad Advanced Active Radiance Serum contains a unique formula that provides superior all-day protection against environmental aggressors that assault skin every day. The remarkable new Vitamin C Tech..
Murad Redness Therapy Soothing Gel Cleanser is an ultra gentle cleanser for soothing redness and dryness while it purifies, hydrates and renews the skin's appearance without causing any irritatio..
Murad Redness Therapy Correcting Moisturizer SPF 15 provides several benefits; it gives all day hydration, protection to sensitive and easily irritated skin. The goji berry and licorice extracts help ..
Murad Essential-C Toner is designed to restore moisture and balance to environmentally compromised skin and boost overall skin health. Murad Essential-C Toner helps to comfort the complexion and resto..
A dual-action foam cleanser that deep cleans to remove dirt and oil as it tightens pores without over-drying leaving skin feeling balanced. This dual-action foam cleanses and exfoliates with AHAs to l..
: Skin Perfecting Lotion is an oil-free moisturizing cream that restructures the skin, by matting down shiny ytpartier and keeping pores clean and astringent. It is perfect for oily or combination ..
: Murad Age Reform Intensive Wrinkle Reducer ™ for Eyes is a serum that reduces the appearance of fine lines and wrinkles, revitalize the skin, improves the skin's own collagen production and gives..
: Murad Renewing Cleansing Cream is suitable for all skin types. The product gently removes excess grease, dirt and debris with its creamy, pearly texture while giving the skin natural luster. Mura..
Murad Resurgence Intensive Age-Diffusing Serum helps to smooth complexions, protect collagen while encourage elasticity, hydrate and blur fine lines and wrinkles. Murad Intensive Age-Diffusing Serum a..
: Now you can experience Dr. Murad's well-known glycolic acid treatment at home. With extra strength helps this peeling to minimize age signs while it cleanses the skin in depth. The formula is pow..
Murad Resurgence Age-Balancing Moisture SPF 30 provides nourishing hydration to hormonal and aging skin for a soft and supple texture. Grapeseed, avocado and sunflower oils work together to moisturize..
: Contains Clarifying Cleanser, 60ml -effective cleansing gel that helps to fight impurities in the skin. Blemish Clearing Solution, 24ml -product that reduces aknerelaterad sensitivity, redn.. Size 235 ml Ingredients Caprylic/Capric Triglyceride, Water, Glycerin, Dimethicone, Sucrose Laurate, Dimethicone/Vinyl Dimethicone Crosspolymer, Polyquaternium-7, Polyqu..
Murad Redness Therapy Sensitive Skin Soothing Serum is designed to soothe redness and irritation caused by rosacea, sunburn, waxing, physical reactions and professional treatments. It helps to increas..
Murad Age Balancing Night Cream is an ultra-rich, overnight hydrating cream which renews skin and minimizes the effects of hormonal aging. Deeply moisturizes to protect against dryness while supportin..
Murad Youth Builder Collagen Support Body Cream instantly triples the skin's moisture content. Collagen Support Complex aids in the improvement of skin's resilience to aging and other damages. Skin is..
: Murad Age Reform Intensive Wrinkle Reducer ™ is a serum that has clinical studies behind it to restore the first signs of aging by reducing fine lines and wrinkles, revitalize the skin and provid..
: This invisible formula with advanced technology is a mix between primer, protection and anti-aging. It immediately smoothes out all the imperfections while fighting the signs of aging. Propert..
Murad Age Reform Time Release Retinol Concentrate For Deep Wrinkles features a precision point applicator to deliver time-release retinol, powerful peptides, and plumping ingredients directly ont..
Murad Detoxifying White Clay Body Cleanser cleanses the skin from head to toe. Impurities are drawn out while the surface of the skin is gently exfoliated and hydrated. The rich, luxuriously silky tex..
: Ingredients Peptide mixture Vitamin E and Shea butter moisturize and soothe to restore the skin's natural softness. The Collagen support complex increases skin elast..
: A silky, weightless moisture processor that optimizes the skin's ability to retain moisture. It leaves the skin soft, plump and moisturized. Ultimate for fine lines and wrinkles, dull and dry ski..
Murad Essential-C Daily Renewal Complex is designed to smooth away fine lines and wrinkles, diminish visible signs of photo damage for a healthier complexion, soothe the skin and neutralize free radic..
Murad Resurgence Age-Diffusing Firming Mask is a rich moisturizing cream mask that instantly tightens and lifts the face, neck, and decollete. When used one to three times weekly, Murad Resurgenc..
Murad Resurgence Rejuvenating Lift for Neck and Decolletage rapidly firms skin and visibly minimizes the appearance of wrinkles and fine lines associated with hormonal aging. A natural botanical blend..
: Murad Blemish Control Blemish Spot Treatment is a punktbehandlande product that is applied directly to the rash and acne and accelerates the healing process. Contains moisture preservation ingredien..
Murad Renewing Cleansing Cream is a cleansing oil rich in botanicals to cleanse and renew the skin gently while maintaining skin’s natural moisture barrier. This light, noncomedogenic cleanser gently ..
: Deep cleansing mask that in just 3 minutes solves oil and impurities, cleanses pores and leaves skin fresh. A talgreglerande complex works by matting down the skin so that it only retains healthy..
: Designed to quickly and effectively reduce pimples by targeting the bacterium that causes pimples and impurities, without irritating. Blemish clearing solution delivers proven efficacy as it was ..
: Contains Renewing Cleansing Cream, 45 ml -rich, creamy, ultra-Fuktgivande cleanser that gently exfoliates. Intensive Age-diffusing Serum, 7.5 ml -immediately tightens and moulds, as well as..
: Murad's City Skin Age Defense Broad Spectrum SPF 50 is a whole new level of sunscreen. This revolutionary and ultra-light sunscreen is based on 100% minerals and gives you a wide range of sunscre..
: Contains Murad Refreshing Cleanser, 45 ml -helps to clear all traces of superficial impurities and make-up without drying out the skin, the product leaves the skin soft and supple. Murad Co..
: A softening peeling that with the help of glycolic acid removes dead skin cells. Hyperpigmentation visibly reduces and emerges a clearer skin with a youthful luster. Properties of Murad Intens..
: An eye cream that effectively fights dark circles under the eyes in a whole new way. Provides moisture and reduces puffiness. Within 15 minutes you can see a noticeable difference and dark circle..
: Contains Murad Essential-C Cleanser, 45 ml -thoroughly resolves contaminants without drying out the skin. Murad Essential-C Active Radiance Serum, 10 ml -is a Serum with a fast-acting formu..
: Fast-acting formula that penetrates pores to reduce inflammation size and redness within 4 hours. Salicylic Acid exfoliates and works anti inflammatory to kill the Aknebakterien while the patente..
: Murad's Oil Free Sunscreen contains a patented formula that is rich in antioxidants. This oil-free sunscreen helps to reduce the signs that the skin is aging prematurely by protecting your skin a..